The patient is a 56 year-old female who underwent hysterectomy and bilateral salpingo-oophorectomy for high grade squamous dysplasia of the cervix. Tissue sections of the cervix revealed a microinvasive squamous cell carcinoma. Unexpectedly, the concurrent pelvic washing cytology showed numerous high-grade tumor cells with a tufting papillary architecture. 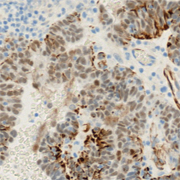 Immunohistochemical staining (p16+, WT-1+, ER+) confirmed the diagnosis of high-grade serous carcinoma of non-endometrial origin. 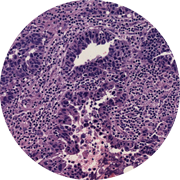 Initial routine tissue sections showed no evidence of neoplasm in either ovary or fallopian tube, and the surgeon did not see any evidence of peritoneal tumor. All remaining ovarian and fallopian tube tissue was then submitted for histologic evaluation. 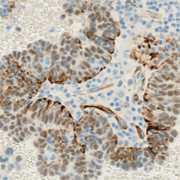 A single 0.7 cm focus of early invasive high-grade serous carcinoma was identified in one of the fallopian tubes. Subsequently, the patient underwent surgical staging including lymph node dissection, and no additional serous carcinoma was identified. 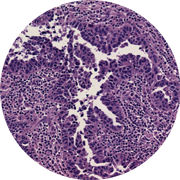 Since many, if not most, non-uterine high grade serous carcinomas are believed to initiate in the fallopian tube as serous tubal intraepithelial carcinoma (STIC), implementation of detailed fallopian tube processing protocols are necessary to diagnose both STIC and microscopic high-grade serous carcinoma. The Sectioning and External Examination of Fimbria protocol (SEE-FIM) requires longitudinal sectioning of the fimbrial end and cross sections at 2-mm intervals of the remaining fallopian tube. To improve detection of microscopic tumor, the SEE-FIM protocol is recommended in all cases of endometrial endometrioid cancers (to identify fallopian tube involvement for correct staging), non-uterine pelvic serous cancers, and serous borderline ovarian tumors.